Extract from Shoalhaven City Council Ordinary Minutes, 22nd February. Note: Clr Soames had left the meeting. Note: Clr Green returned to the meeting and resumed the Chair at the commencement of this matter. a)	The safety of pedestrians using the footpath immediately adjacent to the shops on the Paradise Beach Road side (east), where there are no physical barriers to prevent motor vehicles from colliding with local shoppers. 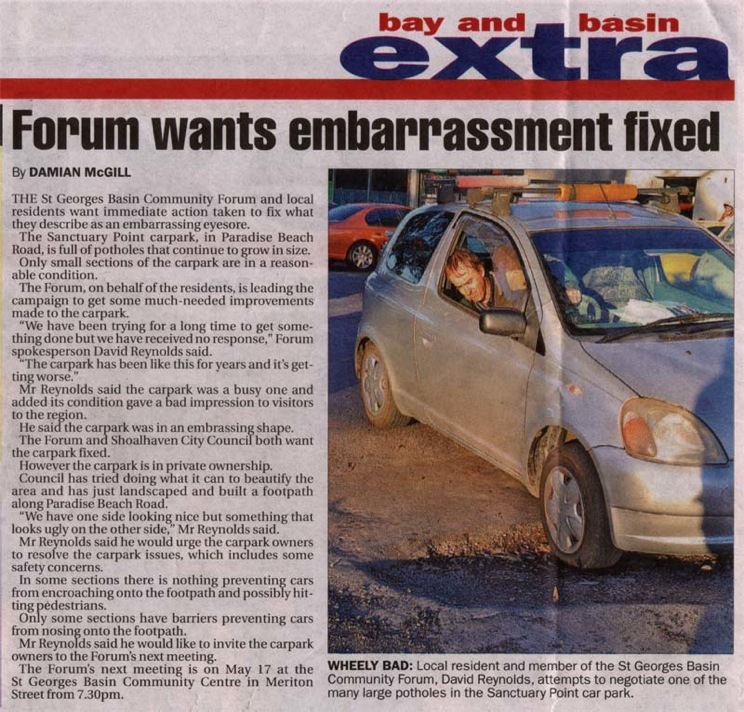 b)	The safety for motorists and pedestrians of the carpark (the Paradise Beach Road side (east), particularly regarding the traffic flow, line-marking and the condition of the surface. c)	The capacity of Council to “inspire” the shop-owners to up-grade their shop facades as well as installing security cameras at the front and rear of their premises. 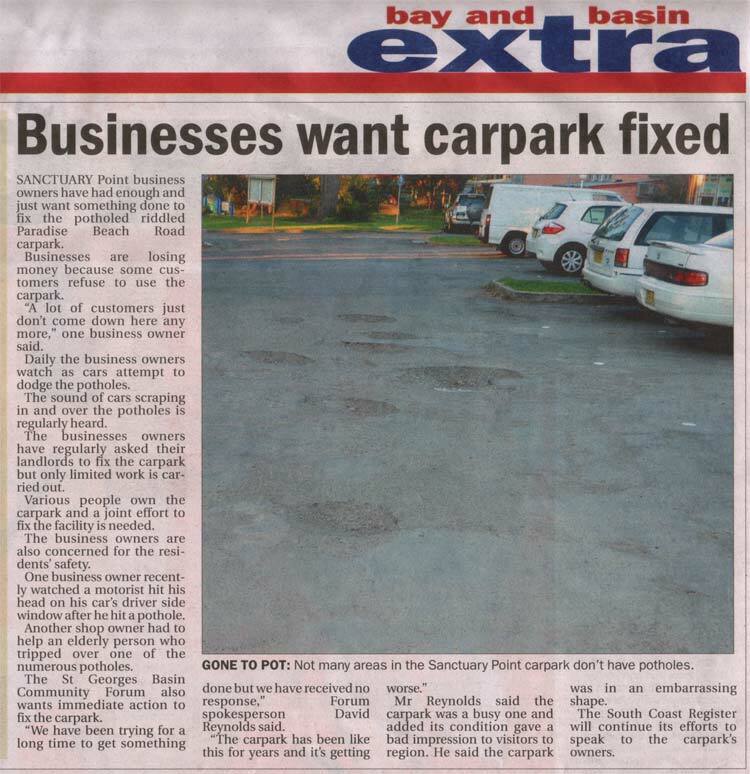 d)	The feasibility of Council compulsorily acquiring the carpark on the Paradise Road side (east). 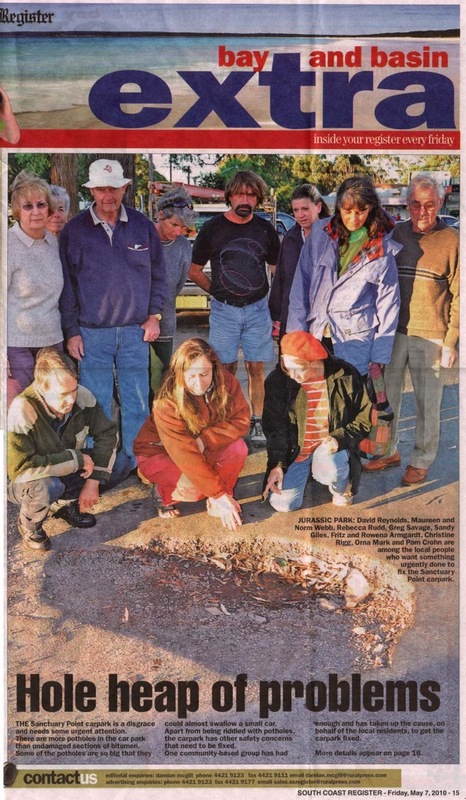 e)	The installation of security cameras at strategic locations in the vicinity of the Francis Ryan amenities block and the public toilets, the carpark and west to the newsagency and nearby shops. An AMENDMENT was moved by Clr Green, seconded Clr Miller, that Council write to the Minister for Police, the Shadow Minister for Police and the Local Candidates for the seat of South Coast indicating that Sanctuary Point is the most needy location for increased policing and the Bay and Basin area be considered for a 24 hour Police Station. The AMENDMENT upon being PUT to the meeting was declared LOST. THE RECORD OF VOTING ON THIS MATTER WAS AS FOLLOWS: The following Councillors voted “Aye”; Clrs Miller, Green. The following Councillors voted “No”; Clrs Fergusson, Bennett, Guile, Brumerskyj, Ward, Kearney, Watson, Proudfoot, Young, Findley. The MOTION upon being PUT to the meeting was declared CARRIED. Friday May 7, 2010. Onsite meeting organised by Basin Villages Forum committee.